New York City Public Worker Pension Funds are on the cusp of selling off or divesting from their fossil fuel stocks. How and why are NYC workers and climate activists so intent on achieving this? What will it mean if they win this? First some background. American workers too often feel overwhelmed by the power of capitalism in general and financial corporations in particular. We may feel we have few economic resources with which to exert our opinions and defend our needs in a system based on money. We may want to challenge “fossil fuel capitalism” that threatens the future for our grandchildren, but how? Most American workers do own capital in the form of their own homes and, especially, in their pension funds. Often the pension funds are managed with the support and participation of their unions or, more specifically, their union leaders. What if union members were to look closely at our pension funds and see how we could use them to create the kind of world we want: investments in renewable energy, public transportation, affordable housing, public education, regenerative agriculture? As a sector, pension funds are the single largest institutional investor followed by banks, investment firms, and insurance companies (Global Pension Statistics Project, GPS). Approximately $40 trillion was invested by pension funds in financial markets in 2015 and that gives workers much more financial punch than we realize or use. Pensions represent deferred compensation to workers and are negotiated through contracts on behalf of union members. The intention is to provide income during retirement years. Workers have the potential financial power through collectively using their pension funds to both protect us through financially insecure times such as these and to have an impact on the world we want to see, the world we want to leave to our children and future generations. Too often the second part of this formula—having an impact on the world we want to see—is totally ignored. A growing number of American workers are questioning the wisdom of keeping their hard-earned deferred income in fossil fuel holdings. Some unions, particularly public service unions, are joining the other financial entities, like universities, faith organizations, and foundations, which have divested their funds from fossil fuel holdings. Pension funds committed to divestment comprised 12% of all divestment commitments. Globally, a full $5.2 trillion in assets has been pledged to divest from fossil fuels. [Arabella Global Divestment Report, 2016] That’s a huge start! We are denying funds from the fossil fuel industry, devaluing their stocks, stopping to “feed the beast”, making fossil fuel corporations pariahs, like we did with tobacco companies that caused cancer. After Trump pulled the US out of the Paris Climate Accords, another big climate march in DC in April, and, especially after the three hurricanes in the Caribbean and Gulf Coast and the wildfires in Northern California, union members have a new desire to do what we can to slow down the process of climate change and move toward a renewable energy economy, one based on equity, not just profit. In New York City, the organizing work of 350.org, Divest NY and NY Communities for Change, and several unions has borne fruit. After five years of pushing for city public pension funds to divest from fossil fuel stocks, providing educational materials, lobbying efforts with politicians and pension board members, meetings with union rank and file and leaders, NYC workers have finally shifted on pension funds and climate change. The “Divest NY” coalition was an integral part of the mass demonstration that commemorated the 5th anniversary of Hurricane Sandy and divestment from fossil fuels in all city and state public pension funds was one of the short list of demands of the march supported by 150 organizations that included over a dozen unions. 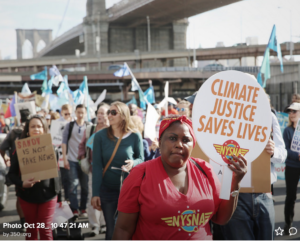 Initiated by sympathetic NYC Public Advocate Letitia James, we are holding a rally and hearing on climate change and divestment on Nov. 29. Expert and community testimony on the effects of fossil fuel holdings on our pension funds and on the future of our planet will be presented at the hearing. NYC workers will be out in large numbers making our voices heard. Each union pension fund functions a bit differently. NYC public worker funds are tightly regulated ostensibly to protect the funds but it can also be fairly difficult to make changes in investments. The NYC pension funds have already divested from coal, private prisons and gun manufacturers. But those holdings were quite small, especially in comparison with their almost $4 billion holdings of fossil fuel stocks. That shift will have to be rolled out over a few years to maximize fund stability but announcing the commitment to divestment could happen any day now. The NYC pension fund trustees are evaluating the carbon footprint of stock holdings and studying the feasibility of divestment. But the reality is we can shift to a fossil free world–they just lack the political will to do so, right now. The unions have the potential to play a major role in this transition if we use both the economic and political the power of labor to push for these changes. Labor can resume its role as the defender of the working class through its insistence on a just transition to a renewable energy economy. The question of “re-investment” of these divested funds is a challenging one. Ideally we would want our pension funds to invest in stocks and bonds that advance both climate protection and social justice. 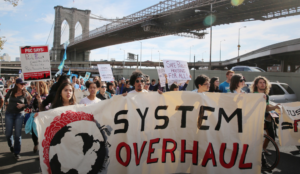 Unfortunately, right now there are few funds available that serve both climate and justice. Each locale or union will need to bring climate justice activists and portfolio managers together to decide on investments that serve the social “good”–climate mitigation and social justice–and are safe investments to maintain the integrity of our pensions. That process can start now, even before the divestment movement succeeds in your union. Bringing in communities most affected by climate change, including union rank and filers, will help us to make investment decisions that will build a better future together. But don’t get sidetracked into thinking we must find those investments before we divest from fossil fuels. We can divest now, help to hobble the dangerous fossil fuel industry, and then, when we are ready with good investment plans, move toward re-investment of those funds. The Divest NY coalition, now joined by activists and leaders in AFSCME District Council 37, United Federation of Teachers, Professional Staff Congress (CUNY-AFT), and supported by Democratic Socialists of America activists, has expanded our reach through a petition drive, extensive leafleting, demonstrations outside of pension board meetings and presentations and resolutions at union meetings. But the most profound shift in worker response to climate change has been the evidence before us with the three major hurricanes and shocking wildfires. We cannot deny that climate change is happening. And we should not deny our power as workers to use what we can—our muscle, our minds, our labor, our influence and our capital in the form of our pensions—to lead the way to a just and sustainable future for Planet Earth. Why Divest Fossil Fuel Stocks from Worker Pension Funds? While stocks are valued according to ALL their assets, 80% of fossil fuel stock assets are in the ground. If we access and burn those fossil fuels, we will go way over a 2 degree C rise in temperature, making life on earth extremely treacherous for humans. Fossil fuel stocks are overvalued, creating a carbon bubble that can burst. Fossil fuel stocks have shown lower performance than the overall stock indices. NYC and NYS pension funds have foregone millions of dollars in positive returns over the last 5 years by maintaining their holdings in fossil fuel stocks. Renewable energy and new technologies will make and are making fossil fuels obsolete. The sharp decline of fossil fuels is inevitable. Unions and pension fund trustees should support fossil fuel divestment to protect our pensions and save workers’ pensions from the nosedive most investors know will take place—it is a matter of when, not if. Workers’ hard earned money should not be going to make the Earth uninhabitable for humans and increasing misery with more frequent and intense hurricanes (Harvey, Irma, Maria), fires, droughts, agricultural disruptions, rising oceans and rivers, increased heat waves, tornadoes and earthquakes. The world just surpassed 400 parts per million of carbon in the atmosphere. We know the safe limit of carbon in the atmosphere to prevent the worst impacts of climate change is 350 parts per million. Minimizing climate change effects and our preparedness for it is still possible but the window of effective opportunity is closing fast—scientists insist we need to act now and over the next 10-12 years to avoid irreversible climate change. We will have to spend all our government funds on disasters instead of basic services. Workers will bear the brunt of these costs, in the present distribution of power.